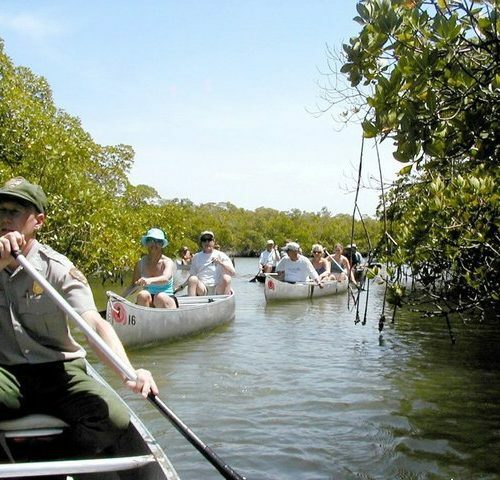 The Everglades National Park preserves a rare combination of aquamarine waters, emerald islands and vibrant coral reefs all within sight of downtown Miami. The park takes advantage of its location next to this growing and diverse metropolis by partnering with a variety of local organizations to provide access for visitors to encounter and explore the scenery, wildlife, history and other amazing resources. Humans arrived in the Florida peninsula approximately 15,000 years ago. Paleo-Indians came to Florida probably following large game that included giant sloths, saber-toothed cats, and spectacled bears. They found an arid landscape that supported plants and animals adapted for desert conditions. However, 6,500 years ago, climate changes brought a wetter landscape; large animals became extinct in Florida, and the Paleo-Indians slowly adapted and became the Archaic peoples. They conformed to the environmental changes, and created many tools with the various resources available. During the Late Archaic period, the climate became wetter again, and approximately 3000 BCE the rise of water tables allowed an increase in population and cultural activity. Florida Indians developed into three distinct but similar cultures that were named for the bodies of water near where they were located: Okeechobee, Caloosahatchee, and Glades. 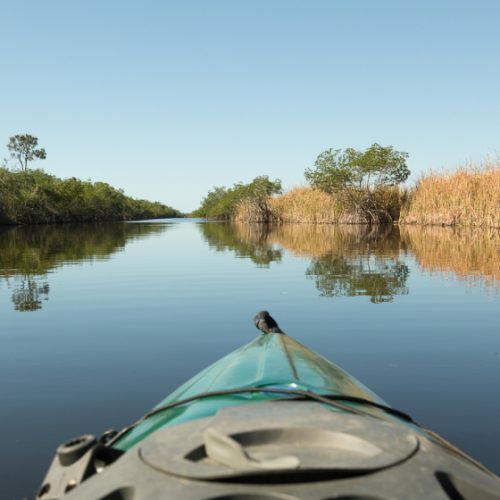 Although people have lived in the Everglades region for thousands of years, within the past 100 years however, they have changed the natural landscape dramatically. Settlement of urban areas in South Florida was facilitated by large drainage projects intended to create more land. The drainage was often implemented without a full understanding of the intricacies of ecosystems and shaping processes of the Everglades. The South Florida metropolitan area grew exponentially, causing problems in ecosystems throughout the Everglades. By the 1990s, the diminishing quality of life in many of these urban areas was linked to the degraded local environment. The State of Florida and the U.S. government devised and passed a plan in 2000 to restore as much of the Everglades to pre-drainage conditions as possible. It is the costliest and most comprehensive environmental restoration project in history. 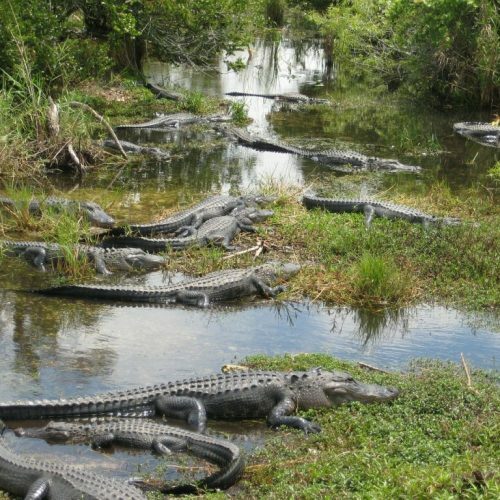 Humans have also adversely impacted the ecology of the Everglades by introducing numerous invasive species, which may prey on or compete with native species. A spectacular and particularly damaging example of this phenomenon is the recent proliferation of the Burmese python in the Everglades, as well as elsewhere in Florida. First observed in the wild in 1979 and not again until 1995, they have increased alarmingly since 2000. By 2011, decreases of 87.5%, 94.1%, 98.9% and 99.3% in sightings of bobcats, white-tailed deer, opossums and raccoons, respectively, were reported in park road surveys, while rabbits were no longer being seen at all. From the Glades peoples, two major nations emerged in the area: the Calusa and the Tequesta. The Calusa was the largest and most powerful nation in South Florida. It controlled fifty villages located on Florida’s west coast, around Lake Okeechobee, and on the Florida Keys. Most Calusa villages were located at the mouths of rivers or on key islands. The Calusa were hunter-gatherers who lived on small game, fish, turtles, alligators, shellfish, and various plants. Most of their tools were made of bone or teeth, although sharpened reeds were also effective for hunting or war. Calusa weapons consisted of bows and arrows, atlatls, and spears. Canoes were used for transportation, and South Florida tribes often canoed through the Everglades, but rarely lived in them. Canoe trips to Cuba were also common. Following the demise of the Calusa and Tequesta, Native Americans in southern Florida were referred to as “Spanish Indians” in the 1740s, probably due to their friendlier relations with Spain. The Creek invaded the Florida peninsula; they conquered and assimilated what was left of pre-Columbian societies into the Creek Confederacy. They were joined by remnant Indian groups and formed the Seminole, a new tribe, by ethnogenesis. The Seminole originally settled in the northern portion of the territory. In addition, free blacks and fugitive slaves made their way to Florida, where Spain had promised slaves freedom and arms if they converted to Catholicism and pledged loyalty to Spain. These African Americans gradually created communities near those of the Seminole, and became known as the Black Seminoles. The groups acted as allies. People who kept more traditional ways had settlements along the Tamiami Trail and tended to speak the Mikasuki language. They later were federally recognized in 1962 as the Miccosukee Tribe of Indians of Florida. As metropolitan areas in South Florida began to grow, the two groups were closely associated with the Everglades. They struggled to maintain privacy while serving as tourist attractions. They earned money by wrestling alligators and selling craftworks. As of 2008, the Seminole Tribe of Florida had five reservations, and the lands of the Miccosukee Tribe of Indians were collectively considered a sixth reservation. The two tribes have each developed casino gaming on some of their properties to generate revenue for support, services and economic development. A national push for expansion and progress in the United States occurred in the later part of the 19th century, which stimulated interest in draining the Everglades for agricultural use. According to historians, “From the middle of the nineteenth century to the middle of the twentieth century, the United States went through a period in which wetland removal was not questioned. Indeed, it was considered the proper thing to do.” Draining the Everglades was suggested as early as 1837, and a resolution in Congress was passed in 1842 that prompted Secretary of Treasury Robert J. Walker to request those with experience in the Everglades to give their opinion on the possibility of drainage. Many officers who had served in the Seminole Wars favored the idea. In 1850 Congress passed a law that gave several states wetlands within their state boundaries. The Swamp and Overflowed Lands Act ensured that the state would be responsible for funding the attempts at developing wetlands into farmlands. Florida quickly formed a committee to consolidate grants to pay for any attempts, though the Civil War and Reconstruction halted progress until after 1877. After the Civil War, a state agency called the Internal Improvement Fund (IIF), whose purpose was to improve Florida’s roads, canals, and rail lines, was discovered to be deeply in debt. 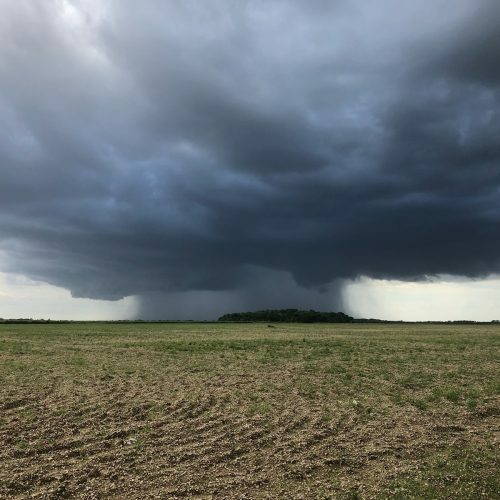 The IIF found a Pennsylvania real estate developer named Hamilton Disston interested in implementing plans to drain the land for agriculture. Disston purchased 4,000,000 acres (16,000 km2) of land for $1 million in 1881, and he began constructing canals near St. Cloud. At first the canals seemed to work in lowering the water levels in the wetlands surrounding the rivers. They were effective in lowering the groundwater, but it became apparent that their capacity was insufficient for the wet season. Though Disston’s canals did not drain well, his purchase primed the economy of Florida. It made news and attracted tourists and land buyers. Within four years property values doubled, and the population increased significantly. The IIF was able to invest in development projects due to Disston purchase, and an opportunity to improve transportation arose when oil tycoon Henry Flagler began purchasing land and building rail lines along the east coast of Florida, as far south as Palm Beach in 1893. Along the way he built resort hotels, transforming territorial outposts into tourist destinations. The land bordering the rail lines was developed as citrus farms. By 1896 the rail line had been extended to Biscayne Bay. Three months after the first train had arrived, the residents of Miami voted to incorporate the town. Miami became a prime destination for extremely wealthy people after the Royal Palm Hotel was opened. During the 1904 gubernatorial race, the strongest candidate, Napoleon Bonaparte Broward, promoted draining the Everglades. He called the future of South Florida the “Empire of the Everglades”. Soon after his successful election, he began work to “drain that abominable pestilence-ridden swamp”, and pushed the Florida legislature to form a group of commissioners to oversee reclamation of flooded lands. In 1907 they established the Everglades Drainage District and began to study how to build the most effective canals, and how to fund them.Governor Broward ran for the U.S. Senate in 1908 but lost. Broward was paid by land developer Richard J. Bolles to tour the state to promote drainage. Elected to the Senate in 1910, Broward died before he could take office. Land in the Everglades was being sold for $15 an acre a month after Broward died. Meanwhile, Henry Flagler continued to build railway stations at towns as soon as the populations warranted them. With the construction of canals, newly reclaimed Everglades land was promoted throughout the United States. Land developers sold 20,000 lots in a few months in 1912. Advertisements promised within eight weeks of arrival, a farmer could be making a living, although for many it took at least two months to clear the land. Some tried burning off the sawgrass or other vegetation, only to learn that the peat continued to burn. Animals and tractors used for plowing got mired in the muck and were useless. When the muck dried, it turned to a fine black powder and created dust storms. Though initially crops sprouted quickly and lushly, they just as quickly wilted and died, seemingly without reason. 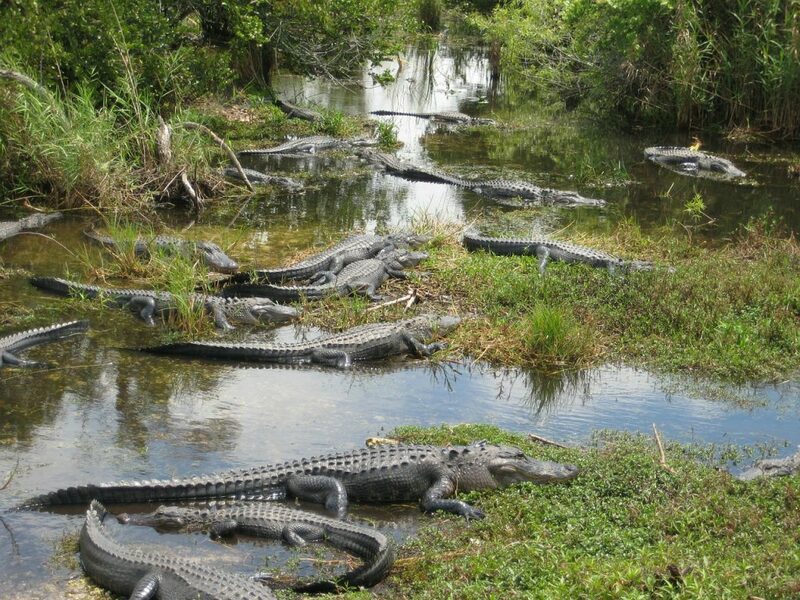 The increasing population in towns near the Everglades hunted in the area. Raccoons and otters were the most widely hunted for their skins. Hunting often went unchecked; in one trip, a Lake Okeechobee hunter killed 250 alligators and 172 otters. Water birds were a particular target of plume hunting. Bird feathers were used in women’s hats in the late 19th and early 20th centuries. Immediately the effects of the Hoover Dike were seen. An extended drought occurred in the 1930s; with the wall preventing water from leaving Lake Okeechobee and canals and ditches removing other water, the Everglades became parched. Peat turned to dust. Salt ocean water intruded into Miami’s wells; when the city brought in an expert to explain why, he discovered that the water in the Everglades was the area’s groundwater—here, it appeared on the surface. In 1939, a million acres (4,000 km²) of Everglades burned, and the black clouds of peat and sawgrass fires hung over Miami. Scientists who took soil samples before draining did not take into account that the organic composition of peat and muck in the Everglades make it prone to soil subsidence when it becomes dry. Naturally occurring bacteria in Everglades peat and muck assist with the process of decomposition under water, which is generally very slow, partially due to the low levels of dissolved oxygen. When water levels became so low that peat and muck were at the surface, the bacteria interacted with much higher levels of oxygen in the air, rapidly breaking down the soil. In some places, homes had to be moved to stilts and 8 feet (2.4 m) of soil was lost. The idea of a national park for the Everglades was pitched in 1928, when a Miami land developer named Ernest F. Coe established the Everglades Tropical National Park Association. It had enough support to be declared a national park by Congress in 1934. It took another 13 years to be dedicated on December 6, 1947. One month before the dedication of the park, a former editor from The Miami Herald and freelance writer named Marjory Stoneman Douglas released her first book titled The Everglades: River of Grass. After researching the region for five years, she described the history and ecology of the South Florida in great detail. She characterized the Everglades as a river instead of a stagnant swamp. The last chapter was titled, “The Eleventh Hour” and warned that the Everglades were dying, although it could be reversed. At only 5,000 years of age, the Everglades is a young region in geological terms. Its ecosystems are in constant flux as a result of the interplay of three factors: the type and amount of water present, the geology of the region, and the frequency and severity of fires. 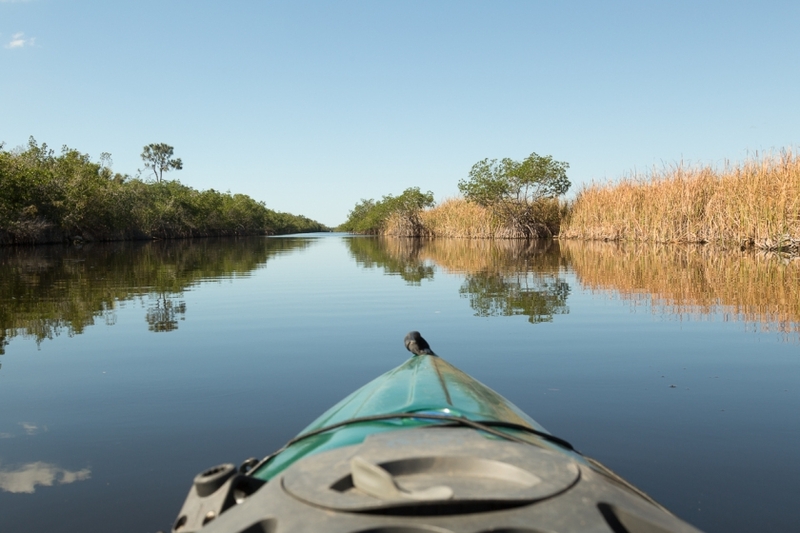 Water is the dominant element in the Everglades, and it shapes the land, vegetation, and animal life of South Florida. The South Florida climate was once arid and semi-arid, interspersed with wet periods. Between 10,000 and 20,000 years ago, sea levels rose, submerging portions of the Florida peninsula and causing the water table to rise. Fresh water saturated the limestone, eroding some of it and creating springs and sinkholes. The abundance of fresh water allowed new vegetation to take root, and through evaporation formed thunderstorms. Limestone was dissolved by the slightly acidic rainwater. The limestone wore away, and groundwater came into contact with the surface, creating a massive wetland ecosystem. Although the region appears flat, the wearing away of the limestone in some areas created slight valleys and plateaus—a difference of inches in elevation—that affected not only the flow of water, but also types of vegetation present. The Everglades are unique; no other wetland system in the world is nourished primarily from the atmosphere. Before the first attempt at draining the Everglades in 1882, the entire watershed extended from Orlando to Florida Bay. 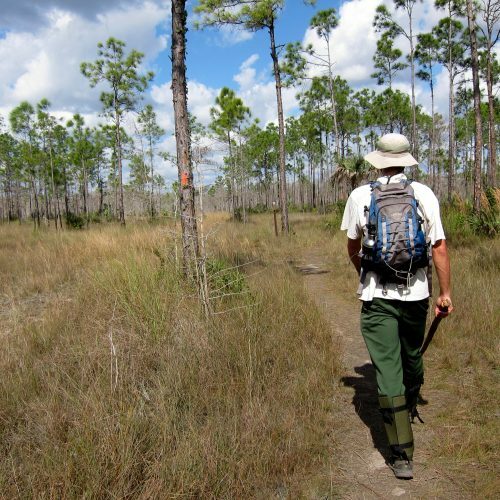 Only two seasons exist in the Everglades: wet (May to November) and dry (December to April). Average annual rainfall in the Everglades is approximately 62 inches (160 cm), though fluctuations of precipitation are normal. Droughts, floods, and tropical storms are normal occurrences in the area. When Lake Okeechobee exceeds its water storage capacity during the wet season, it pours slowly over the southern rim and flows for 100 miles (160 km) to Florida Bay. The gradient change is so slight that the river moves only 2 feet (0.61 m) a minute. Sawgrass thrives in this river, dominates freshwater marshes and sloughs, and is the main characteristic of the region. Severe weather, in the form of tropical storms and hurricanes, also affects the structure of the Everglades. Between 1871 and 2003, 40 tropical cyclones struck the Everglades, usually every one to three years. 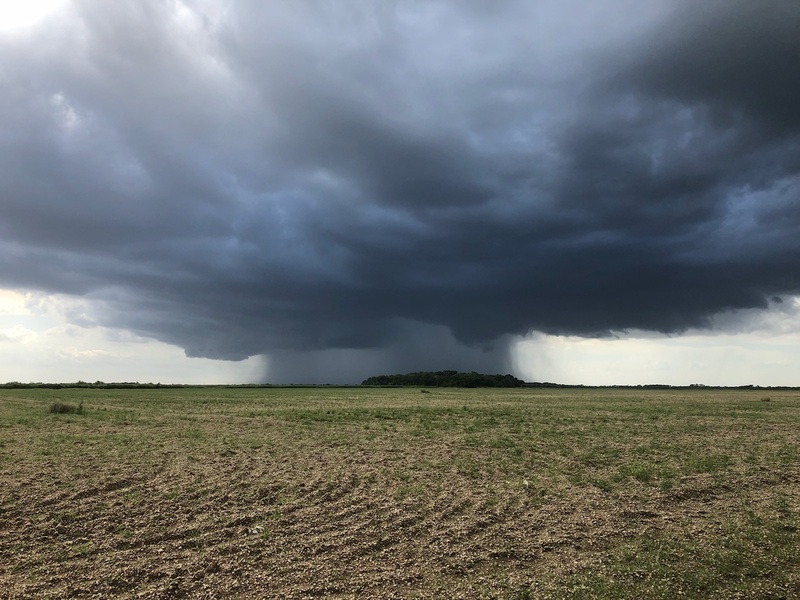 These storms alter the coastline, flush decaying vegetation from estuaries, strip weakened branches from trees, and disperse seeds, pollen, and plant material. Hurricane Donna in 1960 affected 120 square miles (310 km2) of mangrove forests by depositing marl over the roots and depriving the trees of oxygen. It also eradicated orchids, bromeliads, and other epiphytes that once flourished in the mangroves; their reappearance may take a century or more. Donna also significantly spread buttonwood, saltwort, and glasswort, and epiphytes began to grow in new areas. Although the lasting effects remain to be seen, Hurricane Andrew in 1992 also destroyed mangrove forests and snapped slash pines in half. However, regrowth occurred quickly, and sand deposited by the storm surge improved nesting conditions for crocodiles and sea turtles. Ecosystems in the Everglades have been described as both fragile and resilient. Author Michael Grunwald wrote about the observations of the Everglades’ first American visitors: “If the Grand Canyon was a breathtaking painting, the Everglades was a complex drama, and everything in it had a role.” An estimated 11,000 species of seed-bearing plants and 400 species of land or water vertebrates live in the Everglades, but slight variations in water levels affect many organisms and reshape land formations. The health and productivity of any ecosystem relies on the number of species present: the loss of one species weakens the entire ecosystem. For example, Florida apple snails (Pomacea paludosa) are an amphibious freshwater mollusk. They have a single gill and lung, and live on stalks of sawgrass in water depths no more than 20 inches (51 cm). They are the primary food of the endangered Everglades snail kite (Rostrhamus sociabilis) and limpkin (Aramus guarauna) as well as the raccoon, otter, and young alligator. Apple snails lay their eggs on sawgrass stalks about 6 inches (15 cm) above the water line, and they are intolerant of being submerged for long periods of time. When the eggs hatch, young snails must enter the water quickly or face death. When water levels are too low or rise too quickly while snail eggs are developing, apple snails do not flourish, affecting the many reptiles, mammals, and birds that feed on them. With regard to the ecology of trophic dynamics, or food chains, the 174 species of invertebrates play a vital role in the Everglades. Crayfish, insects, scorpions, and other invertebrates also support a web of animals. The group of animals most integral to the overall success of Everglades wildlife is freshwater fish. Few places in the Everglades stay submerged from one year to the next, so alligator holes and deep clefts in the limestone are vital to the survival of fish, and the animal community as a whole. Freshwater fish are the main diet of most wading birds, alligators, and otters, and require large areas of open water in order to repopulate. 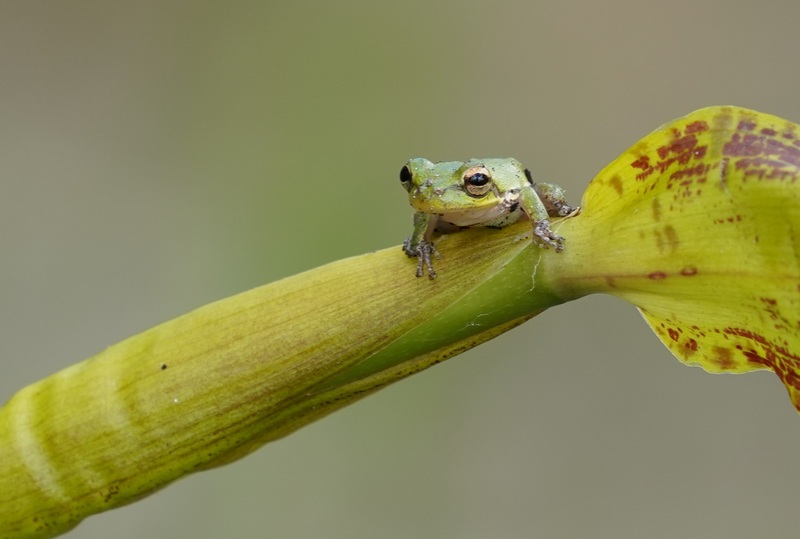 Young amphibians also play an important role in the food chain. Tadpoles spread quickly in isolated areas where fish do not have the time or access to reproduce in numbers necessary to support larger animals. 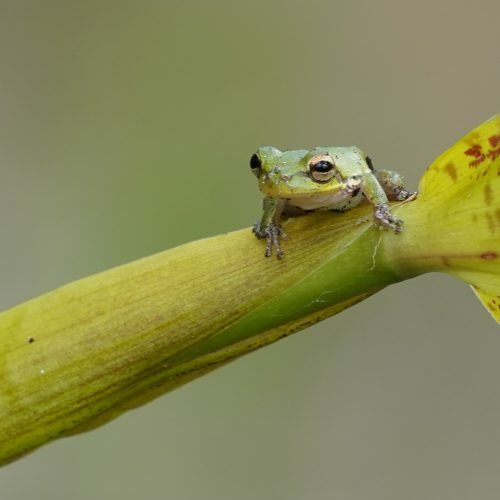 Hundreds of species of amphibians are found in the Everglades, and their availability helps support wildlife during short hydroperiods or in remote locations. 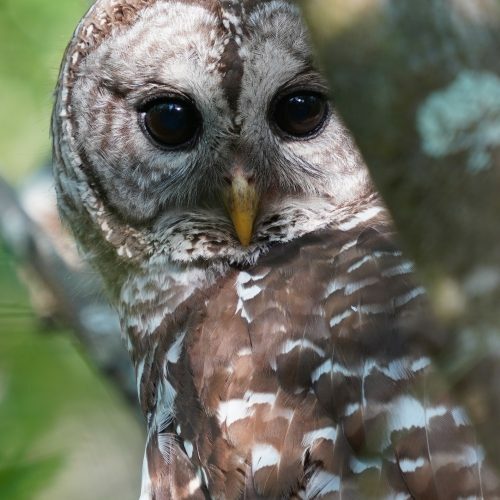 These smaller animals support communities of larger animals, including 70 species of land birds that breed within the Everglades, and 120 water birds, of which 43 breed in the area. Many of these birds go on to migrate through the West Indies and North America. 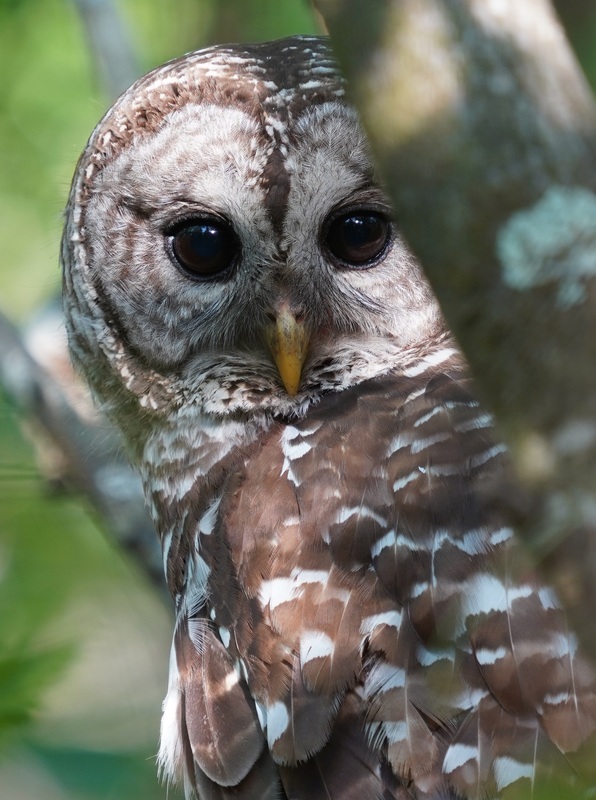 Several dozen species of mammals also thrive in the region, from tiny bats and shrews to midsize raccoons (Procyon lotor), otters (Lontra canadensis), opossums (Didelphis virginiana), and foxes. The largest include white tailed deer (Odocoileus virginianus), the Florida black bear, and the Florida panther. Although slight changes in water level affect many species, the system as a whole also cycles and pulses with each change. Some transformations to the diversity of plant and animal life are natural, caused by fire or storms, and some are induced by humans, such as urban encroachment, the introduction of exotic species, and rapid global warming. 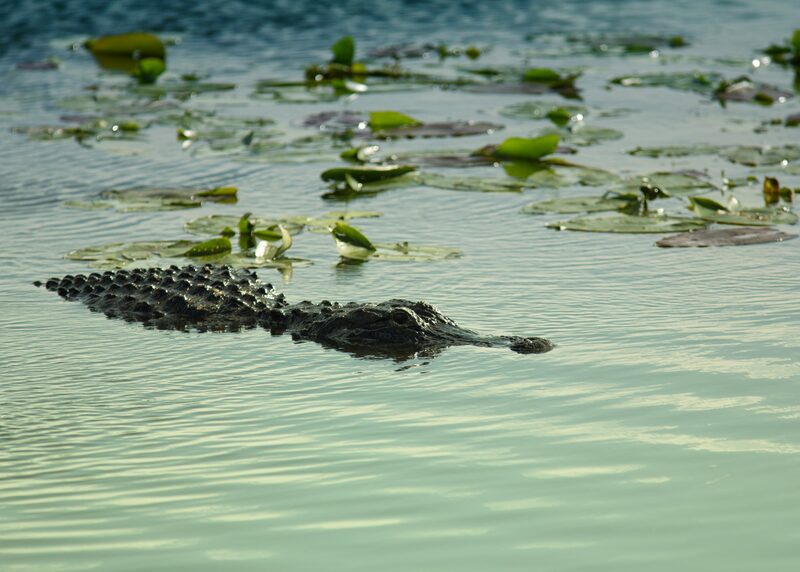 Environmental conditions in the Everglades favor no particular species. Some species, such as snail kites and apple snails, do well in wet conditions, but wood storks and Cape Sable seaside sparrows (Ammodramus maritimus mirabilis) do well in dryer circumstances. Several ecosystems are present in the Everglades, and boundaries between them are subtle or absent. The primary feature of the Everglades is the sawgrass marsh. The iconic water and sawgrass combination in the shallow river 100 miles (160 km) long and 60 miles (97 km) wide that spans from Lake Okeechobee to Florida Bay is often referred to as the “true Everglades” or just “the Glades”. Prior to the first drainage attempts in 1905, the sheetflow occupied nearly a third of the lower Florida peninsula. Sawgrass thrives in the slowly moving water, but may die in unusually deep floods if oxygen is unable to reach its roots. It is particularly vulnerable immediately after a fire. The hydroperiod for the marsh is at least nine months, and can last longer. Where sawgrass grows densely, few animals or other plants live, although alligators choose these locations for nesting. Where there is more room, periphyton grows. Periphyton supports larval insects and amphibians, which in turn are consumed as food by birds, fish, and reptiles. It also absorbs calcium from water, which adds to the calcitic composition of the marl. Sloughs, or free-flowing channels of water, develop in between sawgrass prairies. Sloughs are about 3 feet (0.91 m) deeper than sawgrass marshes, and may stay flooded for at least 11 months out of the year and sometimes multiple years in a row. Aquatic animals such as turtles, alligators, snakes, and fish thrive in sloughs; they usually feed on aquatic invertebrates. Submerged and floating plants grow here, such as bladderwort (Utricularia), water lily (Nymphaeaceae), and spatterdock (Nuphar lutea). Major sloughs in the Everglades system include the Shark River Slough flowing out to Florida Bay, Lostmans River Slough bordering The Big Cypress, and Taylor Slough in the eastern Everglades. Small islands of trees growing on land raised between 1 foot (0.30 m) and 3 feet (0.91 m) above sloughs and prairies are called tropical hardwood hammocks. They may range from one (4,000 m²) to ten acres (40,000 m²) in area, and appear in freshwater sloughs, sawgrass prairies, or pineland. Hammocks are slightly elevated on limestone plateaus risen several inches above the surrounding peat, or they may grow on land that has been unharmed by deep peat fires. Hardwood hammocks exhibit a mixture of subtropical and hardwood trees, such as Southern live oak (Quercus virginiana), gumbo limbo (Bursera simaruba), royal palm (Roystonea), and bustic (Dipholis salicifolia) that grow in very dense clumps.Near the base, sharp saw palmettos (Serenoa repens) flourish, making the hammocks very difficult for people to penetrate, although small mammals, reptiles and amphibians find these islands an ideal habitat. Water in sloughs flows around the islands, creating moats. Though some ecosystems are maintained and promoted by fire, hammocks may take decades or centuries to recover. The moats around the hammocks protect the trees. The trees are limited in height by weather factors such as frost, lightning, and wind; the majority of trees in hammocks grow no higher than 55 feet (17 m). Cypress swamps can be found throughout the Everglades, but the largest covers most of Collier County. The Big Cypress Swamp is located to the west of the sawgrass prairies and sloughs, and it is commonly called “The Big Cypress.” The name refers to its area rather than the height or diameter of the trees; at its most conservative estimate, the swamp measures 1,200 square miles (3,100 km2), but the hydrologic boundary of The Big Cypress can be calculated at over 2,400 square miles (6,200 km2). 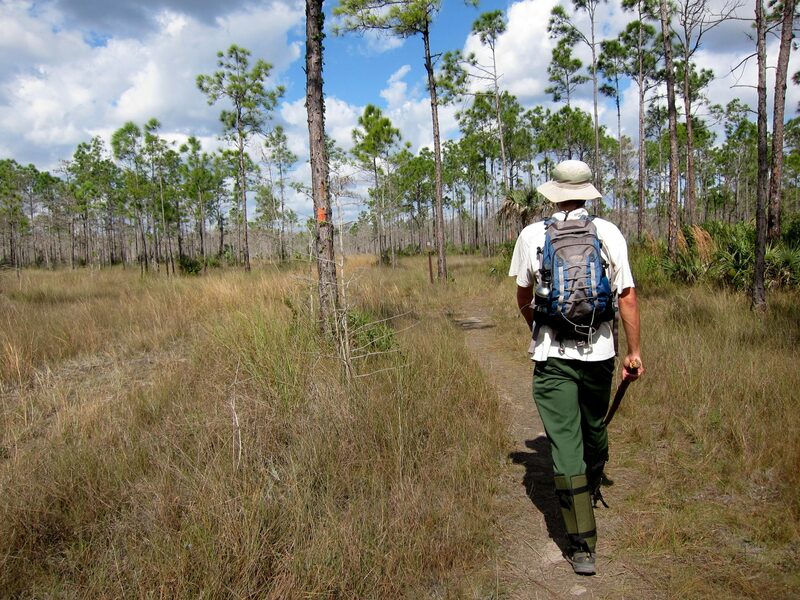 Most of The Big Cypress sits atop a bedrock covered by a thinner layer of limestone. The limestone underneath the Big Cypress contains quartz, which creates sandy soil that hosts a variety of vegetation different from what is found in other areas of the Everglades. The basin for The Big Cypress receives on average 55 inches (140 cm) of water in the wet season. Though The Big Cypress is the largest growth of cypress swamps in South Florida, cypress swamps can be found near the Atlantic Coastal Ridge and between Lake Okeechobee and the Eastern flatwoods, as well as in sawgrass marshes. Cypresses are deciduous conifers that are uniquely adapted to thrive in flooded conditions, with buttressed trunks and root projections that protrude out of the water, called “knees”. Bald cypress trees grow in formations with the tallest and thickest trunks in the center, rooted in the deepest peat. As the peat thins out, cypresses grow smaller and thinner, giving the small forest the appearance of a dome from the outside. They also grow in strands, slightly elevated on a ridge of limestone bordered on either side by sloughs. Other hardwood trees can be found in cypress domes, such as red maple, swamp bay, and pop ash. If cypresses are removed, the hardwoods take over, and the ecosystem is recategorized as a mixed swamp forest. Eventually the water from Lake Okeechobee and The Big Cypress makes its way to the ocean. Mangrove trees are well adapted to the transitional zone of brackish water where fresh and saltwater meet. The estuarine ecosystem of the Ten Thousand Islands, which is comprised almost completely of mangrove forests, covers almost 200,000 acres (810 km2).In the wet season fresh water pours out into Florida Bay, and sawgrass begins to grow closer to the coastline. In the dry season, and particularly in extended periods of drought, the salt water creeps inland into the coastal prairie, an ecosystem that buffers the freshwater marshes by absorbing sea water. Mangrove trees begin to grow in freshwater ecosystems when the salt water goes far enough inland. There are three species of trees that are considered mangroves: red (Rhizophora mangle), black (Avicennia germinans), and white (Laguncularia racemosa), although all are from different families. All grow in oxygen-poor soil, can survive drastic water level changes, and are tolerant of salt, brackish, and freshwater. All three mangrove species are integral to coastline protection during severe storms. Red mangroves have the farthest-reaching roots, trapping sediments that help build coastlines after and between storms. All three types of trees absorb the energy of waves and storm surges. 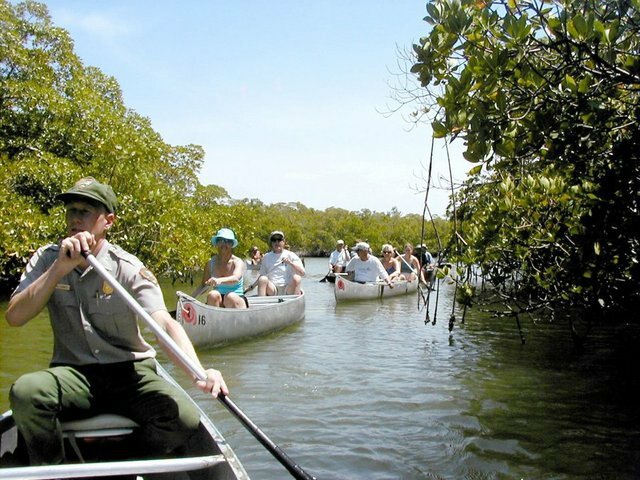 Everglades mangroves also serve as nurseries for crustaceans and fish, and rookeries for birds. The region supports Tortugas pink shrimp (Farfantepenaeus duorarum) and stone crab (Menippe mercenaria) industries; between 80 and 90 percent of commercially harvested crustacean species in Florida’s salt waters are born or spend time near the Everglades. Much of the coast and the inner estuaries are built of mangroves; there is no border between the coastal marshes and the bay. Thus the marine ecosystems in Florida Bay are considered to be a part of the Everglades watershed and one of the ecosystems connected to and affected by the Everglades as a whole. More than 800 square miles (2,100 km2) of Florida Bay is protected by Everglades National Park, representing the largest body of water in the park boundaries. There are approximately 100 keys in Florida Bay, many of which are mangrove forests. The fresh water coming into Florida Bay from the Everglades creates perfect conditions for vast beds of turtle grass and algae formations that are the foundation for animal life in the bay. Sea turtles and manatees eat the grass, while invertebrate animals, such as worms, clams and other mollusks eat the algae formations and microscopic plankton.Female sea turtles return annually to nest on the shore, and manatees spend the winter months in the warmer water of the bay. Sea grasses also serve to stabilize the sea beds and protect shorelines from erosion by absorbing energy from waves.